During the Vietnam war, heavy canvas webbing evolved into its lightweight nylon successors. 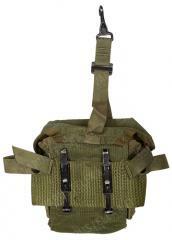 These magazine pouches are meant for 20 rnd M16 magazines. Unlike the M-1956 Universal magazine pouches, these were specifically meant for the 20-round M16 magazines. Each pouch takes 4 magazines, although we've heard you could shove even five in there. Two M14 magazines will also fit. Normally, these pouches have all kinds of straps, which were apparently not too popular among the troops as many of those have been cut off. All the important stuff is still present, of course. 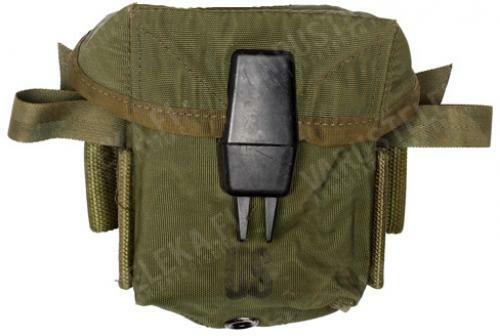 Great little pouches for anyone with the shorter 20-rd AR type magazines. Very compact design & great for attaching to Alice packs, etc.